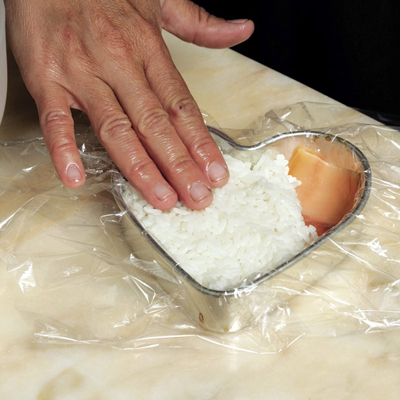 Line a cake tin, gelatine mould or flat glass bowl-a heart shape looks beautiful shape looks beautiful. Arrange a single layer of salmon on the base of the mould. 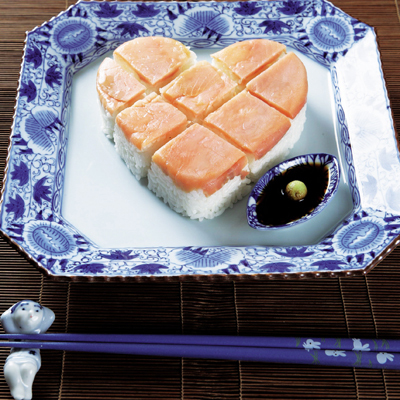 Spoon a little of the sushi rice on top of the salmon and press down lightly with your fingertips. Fill to the edge. 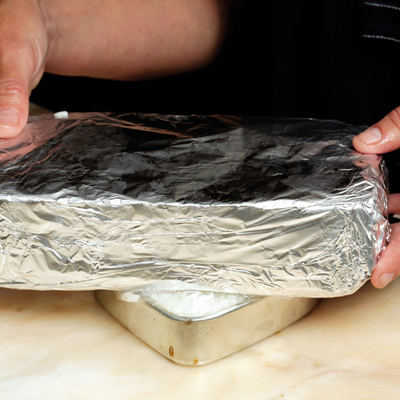 Fold the cling film over the rice, place a heavy weight (a brick covered with aluminium foil works well) on top and leave for 40 minutes. Remove the weight, fold back the cling film and turn out the mould onto a serving platter. Moisten the platter slightly. Carefully remove the cling film and cut the mould into neat squares using a damp knife. Serve with a bowl of soy sauce and wasabi. To view this recipe click here.